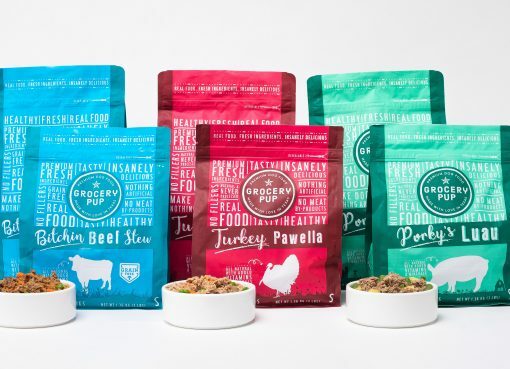 Crave pet foods is a new entrant into the dog food market and is completely taking over the industry due to its protein-packed formulas and affordable price. This is our top-recommended dog food for the cost-conscious. 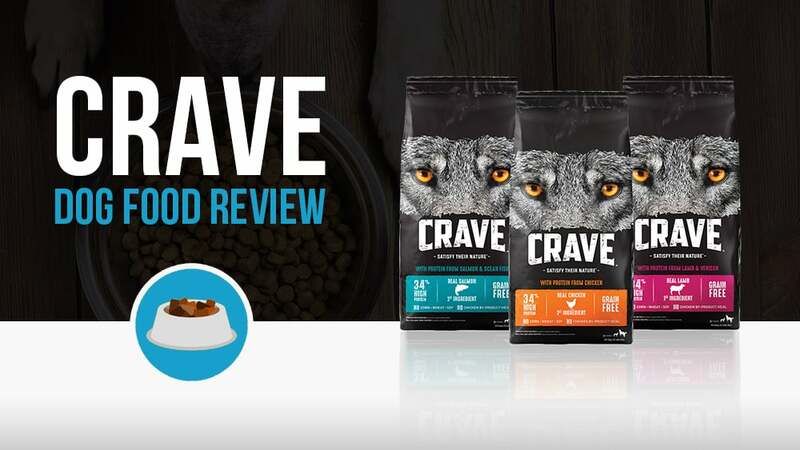 To get a better analysis of what’s inside Crave Dog Food, we sampled the Crave with Lamb & Venison Adult High-Protein Grain-Free. Analyzing the first 10 ingredients in a dog food is a great way to understand the overall nutrient content of the dog food because AAFCO requires all dog food ingredients to be listed in order of predominance by their weight. Here’s a closer look at what’s inside Crave with Lamb & Venison. Deboned Lamb, Chicken Meal, Chickpeas, Split Peas, Lamb Meal, Potato Protein, Chicken Fat (preserved with Mixed Tocopherols), Dried Potatoes,Dehydrated Alfalfa Meal, Venison Meal, Sunflower Oil (preserved with Mixed Tocopherols), Natural Flavor, Flaxseed, Choline Chloride, DL-Methionine, Potassium Chloride, Salt, Mixed Tocopherols and Citric Acid (preservatives), Zinc Sulfate, Niacin Supplement, Biotin, Vitamin E Supplement, Iron Amino Acid Chelate, D-Calcium Pantothenate, Riboflavin Supplement (Vitamin B2), Selenium Yeast, Vitamin B12 Supplement, Copper Amino Acid Chelate, Pyridoxine Hydrochloride (Vitamin B6), Manganese Amino Acid Chelate, Vitamin A Supplement, Thiamine Mononitrate (Vitamin B1), Vitamin D3 Supplement, Folic Acid, Rosemary Extract. The Estimated Nutrient Content in this Crave dog food was found to have a healthy nutrient breakdown. The only questionable ingredient is Natural Flavor, as it’s impossible for us to say what this exactly is. However, we only consider this a concern if it’s listed within the top 10 ingredients, which would mean there’s a much higher concentration of it. Alfalfa: Alfalfa is an herb with many health benefits including arthritis pain relief and it’s loaded with important nutrients. Flax: Flaxseed or flaxseed oil is a great source of healthy fats for your dog. It has a variety of health benefits including anti-inflammatory properties and helps maintain a healthy coat and skin. Methionine: This is a naturally occurring essential amino acid for your dog. Here’s a closeup shot of Crave’s Lamb & Venison kibble. It’s an average size and fairly easy for your dog to chew. 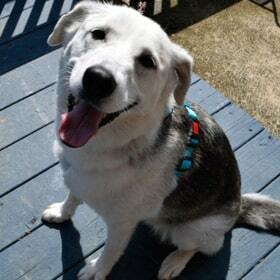 This dog food is also recommended for all breeds and the estimated cost is $1.87 per lb. If price is a primary factor in your choice of dog food, we strongly recommend this brand. The protein content and quality of ingredients is very high especially for the lower price. Farm raised chicken serves as the main ingredient in this line, which is arguably the most popularity variety of the three Crave dog foods. This food is also grain free, and is 34% protein, making it one of the highest-protein formulas on the market today. In addition, the Chicken blend is also packed with several different vitamins and minerals to help ensure that all of your pet’s nutritional needs are met, and that they look and feel as good as they should. This is a great choice for animals who might be particularly picky eaters, or for pet owners who prefer to give their pups a different source of protein. This food also has the high 34% protein that Crave is famous for, and makes use of pasture-raised lamb as the #1 ingredient. Buyers should beware, however, the second ingredient in this formula is chicken meal, so if your dog is particularly sensitive to poultry proteins this might not be the right choice for you. 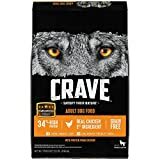 Finding a dog food with a high protein count and fish as the #1 ingredient is not the easiest thing in the world, but Crave delivers with this blend. Much like the Lamb and Venison mix, however, buyers should be aware of the fact that this formula also makes use of chicken meal, meaning that it might not be suitable for dogs with severe allergies to that protein. That said, however, it is an all around high quality food, and is fortified with plenty of vitamins and minerals to ensure a healthy, balanced meal in every bowl. Crave is a brand-new entrant into the marketplace, and represents an attempt by the Mars Corporation to break into the world of high-protein, grain-free recipes that many of todays dog owners seek. Mars is a major player in the pet food field, being behind companies such Eukanuba, Greenies, Iams, Nutro, Pedigree, Pill Pockets, Royal Canin, Sheba, and Whiskas, but this latest line seems to be by far the healthiest and highest quality that they have produced to date. Mars is headquartered in Franklin, Tennessee, and the Crave website promises that all of the bags are manufactured right here in the United States, using food sourced from around the world. It does not, however, specialize where exactly in the world they source from, but the Mars Company typically gets their products from suppliers in the US and Europe. Crave dog food that I spotted at Wegman’s grocery store. The marketing power of Mars, Inc. brings this food to a wide audience. Being so new to the market, Crave’s appearance in so many places might at first be surprising until we remember that they have the marketing team at Mars behind them, gaining access to many markets that would simply be unavailable to other companies. Thanks to the Mars name; Crave can now be found nationwide at stores such as Meijer, Target, Ahold, Walmart, and PetSmart, among others, and is also in many smaller, specialty retailers too. 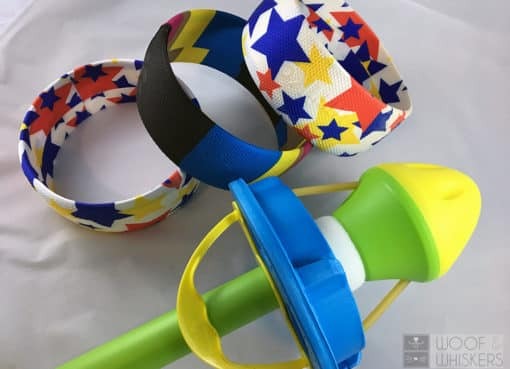 Crave is also easily available online through websites like Chewy or Amazon, as well as directly from the company website, and can also be purchased from Walmart.com. My 10wk old lab puppy was eating another brand, but he started leaving his food and going over to the cat bowl to steal the Crave I bought our cat. So to fix the problem I started giving the puppy Crave Lamb & Venison and he couldn’t eat it fast enough! (Also I think his bowel mvmt got better too). But he has a shiny coat, tons of energy and growing like a weed!